A large family of dicotyledonous plants in the order Polemoniales characterized by internal phloem, the presence of chlorophyll, two ovules per carpel, and plicate cotyledons. Includes Morning Glory. 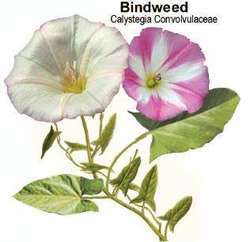 Aggressive vine with funnel-shaped flowers with 5 fused petals. Roots and young shoots used medicinally on some types as survival food and purgative, (causing the body to purge itself), but flowers overall not recommended for consumption because of hallucinogenic compounds. Be careful with these. Some are toxic, some aren’t. Too many for this book too explain. Do research.